This post follows on from an earlier article about how Craftybase calculates your material costs. It's helpful to read this article first to gain an understanding of the materials side of things before moving on to this one, but we'll try to recap as much as possible. Now that we have the idea on how material unit prices are calculated, we can move on to how this affects manufactures and ultimately your order costs. The way Craftybase manages stock for products is almost identical to materials, in that we use a rolling average calculation to calculate the value of your stock on hand at any point in the past. To visualise this using a similar example as materials, imagine you have a box containing a particular product you make. Every time you make a new amount of this product, you add it into the box and each time you sell the product you remove the amount sold. Whenever you change the quantity inside the box, the unit price for the box recalculates to represent the value now inside the box. Adding many products at a lower material cost to your box will have the effect of bringing the average unit price downwards; adding products with a higher cost will make everything slightly more costly. 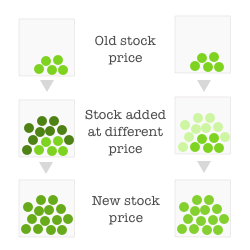 If you only ever add one manufacture to the box and then immediately remove it again to sell it, then your material price will be essentially the same as the exact cost of manufacture (this is the most common case for made-to-order situations). Manufactures are the mechanism that calculates your cost of production for your products. They can do this by finding the cost of all materials on the date of manufacture. Say you make 4 of your "Red Bead Necklace" product on the 3 Feb 2016. When you add in a manufacture for this date, Craftybase will calculate what the unit cost was for each of the ingredients included in the manufacture on this exact date. Craftybase then calculates the total material cost for the products made and adds it into the adjustment history for your product. This is essentially when your stock gets added to "the box" in the example above: as you have a quantity made and a material cost then the adjustment is recorded - which can now be used to recalculate the total value of product in the box when we need this figure. When an order is recorded, Craftybase will look at the adjustment history for each product sold and use this to calculate the unit cost. If the order has not yet been shipped, no material cost is calculated as your stock has not yet left your premises. For inventory valuation purposes, this order is still considered part of your inventory asset and has not yet been moved to COGS. When the order is marked as shipped, the order will be costed. Zero material costs for your orders usually means that you have a gap somewhere in your inventory history for the product or variation - if you haven't accounted for material purchase somewhere in the past, you'll find that your previous manufactures will have a low or zero costing which will then impact your manufactures after this point in time. 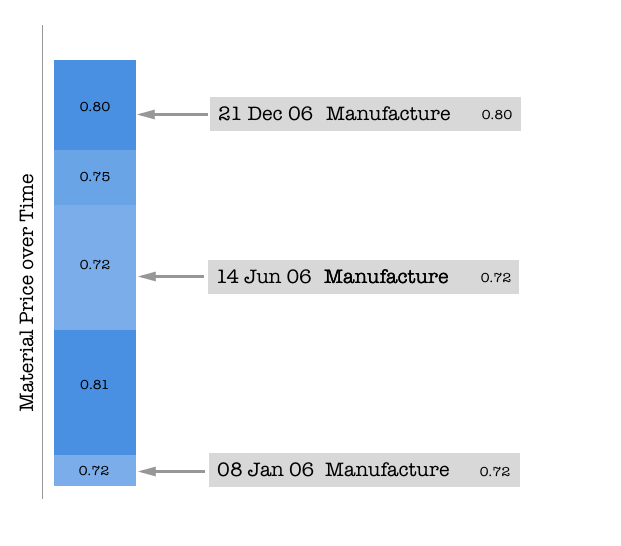 In a similar fashion, if you haven't added your manufacture history to ensure enough stock is available you'll start to see lower or zero product material costings. Do you have enough stock on hand? Check each project / variation within the order to ensure that you had enough stock on hand on the date when the order was shipped. If you have zero or negative stock on hand at the point where the order was shipped, then your material costs will display as zero until this situation is rectified. You can review your stock adjustments and levels via the Inventory tab on each Project / Variation page. Are your manufactures correctly costed? 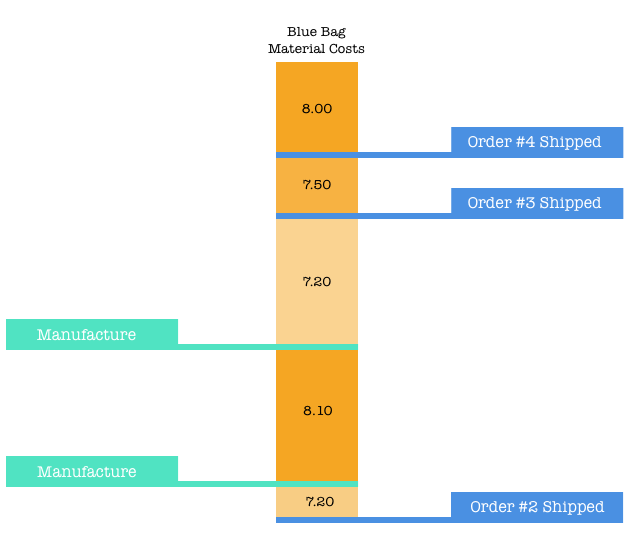 If you have added manufactures on a date where your materials were not in stock, then your manufacture will be costed as zero - this will affect your product costings. To rectify, review the inventory adjustments and levels via the Inventory tab on each Material page within your manufacture.